I have sometimes wondered why Scriabin’s Chopinesque Piano Concerto is not more popular. It doesn’t possess the sheer power of Rachmaninov’s first concerto (in its original form) dating from 1891, and his first symphony dating from the same year as the Scriabin, is a powerhouse in comparison. However, Scriabin’s middle movement consisting of a charming, melodious set of variations, should alone ensure its popularity. In addition, he employs his abundant melodic gift to considerable effect in the outer movements, and he closes the piece in a rousing manner, which might be thought to ensure that members of an audience, used to such things in 19th and early 20th century concerti, would leave their seats contented. I have never heard it performed live, and recordings of it, whilst hardly scarce, are not exactly thick on the ground. I have a Decca CD which provides the same content - Ashkenazy and the Berlin Radio Symphony Orchestra with Peter Jablonski at the piano. 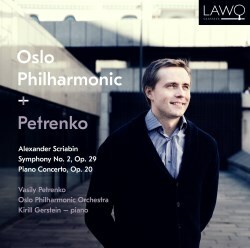 I don’t think much of the orchestral playing in this Berlin account of the second symphony – very often sloppy and imprecise, although things improve in the concerto, but it is taken a bit too slowly – 27:34 as opposed to 25:41 in the Petrenko/Gerstein account. In addition, the Decca recording, now 20 years old, is uncharacteristically opaque at times in the symphony, whereas this LAWO recording has great clarity and warmth too. This is highly recommendable version of the concerto, poetic when required – the theme and first variation in the slow movement are exquisite – and listening to it, one can only wonder at the immense change in Scriabin’s musical vocabulary that occurred in the following few years. Critics had a field day with the Second Symphony (a Second Cacophony! ), and Scriabin himself was unhappy, particularly with the last movement. He said that he wanted to achieve movement into musical light, but instead had only managed a military parade. He was, if you like, only at the beginning of his own journey into an elevated musical consciousness, and had made an initial stumble. This performance is impressive and has plenty of impact, but the Andante is taken rather slowly – playing for 18 minutes whereas Muti’s highly regarded EMI recording dating from 1989 whizzes through it in 13:40. Having said that, listening to it without first trying the Muti, I didn’t consider it be slow. It is a beautiful affair, in which twittering woodwind introduce a pastoral calm, leading to a more impassioned orchestral interlude. Similar contrasts occur throughout the movement, and I can understand and appreciate a desire to linger on the part of Petrenko. The heavily criticised ‘march’ which constitutes the finale is more like a triumphant hymn, and here it forms an effective peroration. The whole symphony, in its melodic late romanticism deserves to be played more, and I feel sure that it would gain an appreciative audience. This recording is a fine one and should satisfy a listener receptive to Scriabin’s early idiom.